Continuous Integration is an Agile Practice for the continuous integration of new Source Code into the Code Base including the automated compile, build and running of tests. From traditional Quality Assurance we know Software Metrics as a very good approach to measure Software Quality. Combining both there is a promising approach to control and ensure the internal Software Quality. 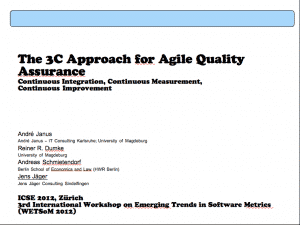 This paper introduces the 3C Approach, which is an extension to the Agile Practice Continuous Integration: It adds Continuous Measurement and Continuous Improvement as subsequent Activities to CI and establishes Metric-based Quality-Gates for an Agile Quality Assurance. It was developed and proven in an Agile Maintenance and Evolution project for the automotive Industry at T-Systems International – a large German ICT company. Within the project the approach was used for a (legacy) Java-based Web Application including the use of Open Source Tools from the Java Eco-System. But the approach is not limited to these technical boundaries as similar tools are available also for other technical platforms. You can download the full paper on the ICSE conference website. thanks. I think the audience liked it too.